• This should exercise the old grey matter. It's not the sort of movie that stimulates the old grey matter much. He'll walk you through the procedure. She walked me through a demonstration of the software. She walked me through the six-page document. I don’t like inviting Tina to my party, she’s such a wet blanket. She will ruin our mood by her deep sighs and gloomy remarks. 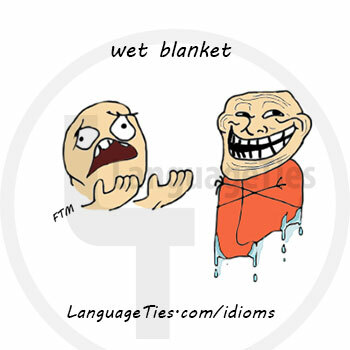 wet blanket noun, pl ~ -kets [count] informal : a person who makes it difficult for other people to enjoy themselves by complaining, by showing no enthusiasm, etc. Don’t jump the gun on it. I’ll tell Ely about the proposal before it’s the right time or you’ll spoil the surprise. • The newspaper jumped the gun [=acted too soon] and announced the wrong candidate as winner of the election. South Korean companies are making employees. 1) ADJ Turkish means belonging or relating to Turkey, or to its people, language, or culture. 2) N-UNCOUNT Turkish is the main language spoken in Turkey. • He is from Ankara, the Turkish capital.